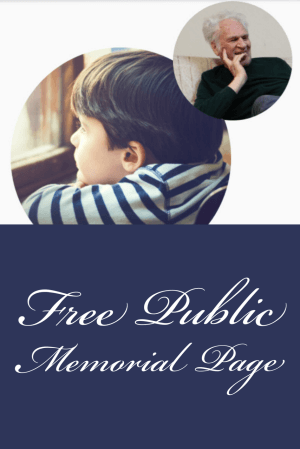 Creating free online memorials for your deceased relatives and ancestors is a wonderful way to remember and honor them. Genealogy giant Ancestry.com has created a new portal for posting these free online obituaries. Here’s what Ancestry.com’s “We Remember” tool is all about, and how you can use it. For several years, I have been concerned that newspaper obituaries are quietly going away, along with the popularity of print newspapers themselves. Obituaries and death notices fill important purposes. They help a family and community say goodbye. They pay tribute to loved ones and to lives well-lived (or ended too soon). They quietly but effectively spread news of a death, removing some of that burden from a grieving family. And for years to come, newspaper obituaries help genealogists learn their family history. They only reach those within our social media reach. They often don’t contain the same rich genealogical information an obituary may mention. Some may not easily be searchable by those who want to find them. As younger generations age into the role of decision-makers after a loved one passes, they will decide on behalf of a family how and where a loved one is formally memorialized. Print obituaries may not seem important or relevant to those who don’t rely so heavily on newspapers. Online memorials posted by funeral homes and sites such as Legacy.com have somewhat filled this gap. They have brought obituaries into dedicated online spaces where loved ones can share biographical information, photos and memories. However, many online memorials are only published temporarily. Many require a fee either to create or to maintain—or both. Guestbook: Lists all who have signed the page and how they are connected to the deceased (family, friends, coworkers, schoolmates). Memories: Shows memories people have added. So far, this photos and stories; Ancestry.com hopes to add audio and video options in the future. The web-based platform doesn’t require an app and can be used from your computer, tablet or smart phone. The memorials are interactive and “intended for sharing and collaborating, gathering everyone’s memories together. There are multiple options for sharing on the site: email, Facebook, or just copying the link and sharing it directly with friends and family.” You can post questions for those who visit to answer. 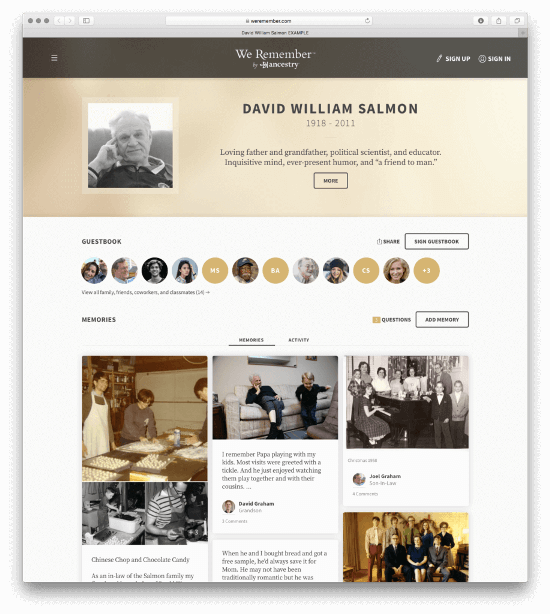 Essentially, ‘We Remember’ brings the death notice announcement out of your everyday social media environment and creates a stand-alone place for anyone who is online to visit. Of course, questions immediately arise about how permanent and free this service will remain, and whether it will become searchable so others may discover their family history on it. Here at Genealogy Gems, we always advise not relying on any single online or offline ‘container’ for your memories, photos and other family history treasures. Genealogy technology expert Lisa Louise Cooke always advises sharing online in selected places, but keeping master files of everything offline and backed up. What about other questions concerning privacy and managing the memorial? The site has a frequently asked questions page that addresses whether you need an account, how to limit access and manage content posted by others and more. Clearly, ‘We Remember’ is still a work-in-progress by genealogy giant Ancestry.com. But the portal is free, easy to use and beautifully-formatted. Check it out for yourself and consider using it as one way to share the news of a loved one’s death. If you do decide to use it, don’t forget to save a copy offline of the memories and photos posted by others: screenshot them if necessary! One of Lisa Louise Cooke’s many inspiring talents is creating short, powerful family history videos that help her celebrate the people and memories that matter most. She does a fabulous job of teaching step-by-step how we can do the same! Click here to follow her instructions on how to create a short video to spotlight a loved one. Sunny Morton is a Contributing Editor at Lisa Louise Cooke’s Genealogy Gems; her voice is often heard on the Genealogy Gems Podcast and Genealogy Gems Premium Podcast. She’s especially known for her expertise on the world’s biggest family history websites (she’s the author of Genealogy Giants: Comparing the 4 Major Websites); writing personal and family histories (she also wrote Story of My Life: A Workbook for Preserving Your Legacy); and sharing her latest favorite reads for the Genealogy Gems Book Club. 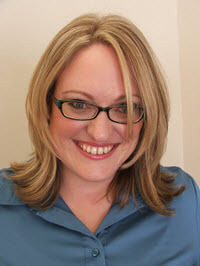 Sunny is also a Contributing Editor at Family Tree Magazine and the NGS-award-winning Co-Editor of Ohio Genealogy News.